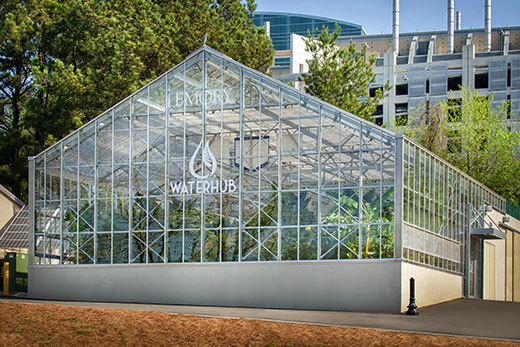 In April, Emory celebrated the grand opening of the WaterHub, an innovative on-site water re-use system that will provide nearly 90 percent of campus utility water needs. After a decade of cutting-edge advances toward creating an environmentally sustainable campus, the university is seeking feedback on its vision for the future. Photo courtesy David Fisher. After a decade of cutting-edge advances toward creating a sustainable campus — environmentally, socially and economically — Emory is crafting a vision for the future, and the university community is invited to join in the conversation. As a part of the university's visioning process, the Sustainability Visioning Committee invites everyone at Emory to engage in a community conversation to help guide and inspire the types of"environmental dimensions of sustainability" that will serve the campus community over the next five to 10 years. Toward that goal, the committee has crafted a draft Sustainability Vision and Strategic Plan, and the Emory community is encouraged to review it in order to help fuel conversations about future goals and initiatives and to provide feedback and suggestions about the next steps for sustainability at Emory. "We've tried to make this opportunity as easy as possible for the Emory community, offering several different ways to encourage groups to talk about the document, particularly in their own schools and units, where important ideas often emerge," says anthropology professor Peggy Barlett, who co-chairs the Sustainability Visioning Committee along with Matthew Early, vice president of Campus Services. In a campus-wide email released earlier this month, Emory staff, faculty, administrators, alumni and students were invited to join in the consultation process by using a"Community Conversation Kit" that offers everyone the opportunity to weigh in on ways to contribute to sustainability at Emory. 1. Get informed: Since sustainability was identified as a fundamental guiding principle at Emory during the first strategic planning process in 2004-2005, the university has earned national acclaim for its innovations in green building, curriculum development, sustainable food and procurement, and energy and water conservation. Review Emory's current sustainability efforts. 2. Community conversations: Recruit a gathering of co-workers, friends or colleagues to read and discuss the sustainability draft document and provide feedback by Oct. 1, answering three questions that address what you like about the document, concerns or gaps in the vision or strategies, and suggested actions that might help achieve the vision. Feedback will also be gathered from Emory experts and Atlanta thought leaders and a"graffiti wall" that will be made available every Tuesday through September at Emory's Farmers Market. 3. Next steps: Your contribution to a sustainable future: Consider how you or your department, office or school might strengthen Emory's sustainability commitments, considering how goals in the document might be realized in the workplace. While many in Emory's leadership and academic community have been consulted for input into the university's sustainability strategic plan in past years, this marks the first time that the entire community has been invited to engage in the process, explains Barlett, who is Goodrich C. White Professor of Anthropology and faculty sustainability liaison. "I'm excited to have the opportunity to have groups and colleagues get together to discuss the document and give us feedback," she says. In preparing the visioning document, the committee"took stock of what we have accomplished over the past decade," according to Barlett. Much has changed around building enthusiasm and awareness for sustainability efforts over the last decade, Barlett says. "Even 10 years ago, people really didn't have a lot of experience with these issues. Now, they know that Emory is engaged in many sustainability initiatives — although they still don't often exactly know how much — so the level of ownership is very different." "Overall, I think that as a society, all sectors are becoming more aware of sustainability issues and more sophisticated about how we can all contribute," she adds. Within the current sustainability visioning process, the invitation to the Emory community is to dream big. "Sustainability affects us all," Barlett says. "Looking out across the community, we would like to really stimulate the imagination, examining new avenues for collaboration and cooperation, and ways to bring these ideas into schools, offices and units." Community suggestions and feedback will be compiled in October, and a digest of responses will be available to all participants. The Sustainability Visioning Committee will then revise the original draft report, which will be submitted for final approvals and shared with the Emory community in January 2016. For more information, or to access the community conversation kit, view"Sustainability Vision 2016-2025: A Community Conversation About Our Shared Future."